On 28 July 1976, Lindsay Park’s great sire Without Fear set an Australian and world record of 30 2YO winners in a season when the filly Point Blank scored at Gawler in South Australia. The world record endured until 1998 when End Sweep, who subsequently stood at Arrowfield, posted 33 individual winners from his first US-bred crop. The Australian record has been much harder to crack but, almost exactly 40 years later, Snitzel has equalled it. The critical victory was finally achieved on Saturday 23 July by the filly Bukzel, who scored on debut at Newcastle for trainers Peter & Paul Snowden and apprentice jockey Nick Heywood. It’s fitting that Bukzel delivered the milestone win because her breeder and owners spotted Snitzel early in his career, before seven Group 1 winners and nine million-dollar yearlings made him Australia’s hottest young sire. Bukzel is out of the unraced Jeune mare Bukhoor from the celebrated Easy Date family and was bred by Stuart Ramsey’s Turangga Farm which has used Snitzel regularly since his second season at stud. Sent to the 2015 Magic Millions Sale, Bukzel was bought for $135,000 by Chris & Michael Ward of Triple Crown Syndications. Said Chris after Bukzel’s win, “We’re thrilled to provide Snitzel’s milestone two-year-old winner today with Bukzel. She’s a promising filly we have plenty of time for. Chris added, “Snitzel has been so good to us. He’s a stallion we identified early and he’s repaid us many times over. Not only does he produce fast and precocious horses, but tough horses too. Triple Crown bought Hot Snitzel for $60,000 from Arrowfield’s draft at the 2010 Inglis Melbourne Premier Sale. The ebullient chestnut colt matured into the classy, professional sprinter who ended his career with the 2015 BTC Cup G1 and earnings of $1.3 million. Chris & Michael returned to Arrowfield’s draft at the 2011 Melbourne Sale to pick up Flying Snitzel for just $25,000. Three years, two Group wins and $340,000 prizemoney later, she was sold to Widden Stud as a broodmare for $410,000. Triple Crown syndicates have enjoyed success with other Snitzel progeny, including El Sasso (six wins, most recently at Rosehill on 2 July) and Listed winner Redzel who also won on Saturday, over 1100 metres at Canterbury. Snitzel’s 30 winners of forty races from his 2013 crop include his 17th & 18th juvenile stakeswinners, El Divino and Modern Wonder, and another 13 city winners. Queensland filly Spot The Diff gets the award for Most Wins with five, ahead of six two-time winners: El Divino, Russian Revolution & Thronum (Sydney), The Seductress (Melbourne), High Conviction (Perth) and the South African-owned colt Simply Blue (Turffontein). With eight days left of the 2015/16 season, Snitzel has time to claim exclusive ownership of the 2YO winners record. 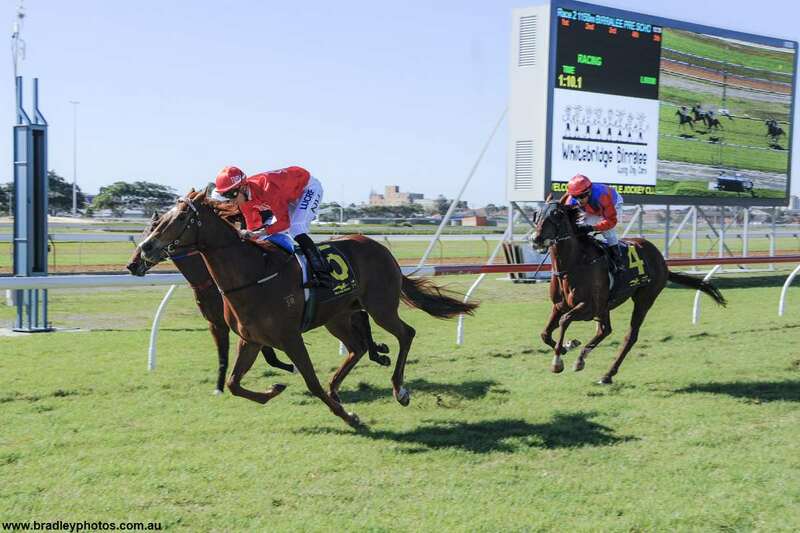 Three first starters at Hawkesbury on Sunday are his next chances of getting winner No. 31: America & Samantha (both trained by Gerald Ryan) and another Snowden runner, Calanda. The making of juvenile sire history is only part of Snitzel’s story this season. He’s about to complete his fifth consecutive top 10 finish on the Australian General Sires’ premiership, and his lifetime record of stakeswinners has increased to thirty-eight. New stars for him this season include Hong Kong Champion Miler Sun Jewellery, Group-winning 3YOs Spill The Beans (now at stud) & Perignon and his 17th & 18th juvenile stakeswinners El Divino and Modern Wonder. The good news continued in the sale-ring too. A trio of Snitzel colts topped each of the three major Australian yearling sales (Magic Millions Gold Coast, Inglis Easter & Inglis Melbourne), and his Easter 1 average was $438,000. In all, five colts by Snitzel made $1 million or more this year, among them Australia’s top-priced yearling of 2016, the brother to El Divino & half-brother to Winx offered by Segenhoe Stud for breeder Fairway Thoroughbreds. He was knocked down for $2.3 million to Gai Waterhouse & Julian Blaxland at Inglis Easter. Racetrack results and sale-ring demand have firmly established Snitzel’s quality as a sire, and he has the numbers to maintain the momentum. Breeders have sent him an average of 225 mares for each of the past four seasons, and he is once again fully booked in 2016.